Our kids can see the shows we watched in our childhood, but they'll never see them the same way we did. I feel like an antique when I say I remember having a black-and-white TV. We had both, but the little B&W one was in our kitchen, and later briefly in my room. They had antennas, that we constantly had to adjust. They had Vertical and Horizontal Hold. They had UHF channels. They didn't have remotes--we had to get up and change the channels and volume ourselves. They came on slowly...they had to warm up...and they turned off the same way, leaving a little rainbow square in the center of the screen until it finally faded. Some channels actually went off the air with the national anthem and then the screen went to a test pattern--nothing like the 24-hour programming of today. Our TVs certainly didn't have TiVo or VCR/DVD players...we couldn't watch anything other than what was on the five or so channels that we got at any particular time, and we certainly couldn't fast-forward the commercials or freeze or rewind a moment in the show. We sure didn't have onscreen program guides, and we couldn't get news or sports from other cities. But we didn't know all this would one day be available. We thought we were darn lucky to have what we had, and when the technological changes came, they came so slowly and over so much time that we don't even realize how shocked we would be by what we once thought was state-of-the-art viewing. What do you remember about the less-technologically-advanced TVs of your childhood? Color TVs were less common than B&Ws when I was a kid in the late 60s/early 70s. It was a big deal when you'd go to someone's house and they'd have a color set, even though the color itself was always horrible. The owners would constantly be fussing with the color knob and the people on screen would have faces that would either be an alcoholic shade of red or a nice grassy green. Ahh the B&W tv. My family was the first around to have cable and at one point we had the cable split to a B&W tv. State of the art meets, how old is that? I even took a small B&W tv to college, in 1995! I get frustrated having to explain the concept of "live" tv. That is watching tv as it's being aired. My kids kept complaining that we weren't skipping commercials. I told them that was how I grew up. No skipping commercials. Sylko, we feel your pain. My brother just took his four-year-old son to his first NHL game, and the kid -- brought up watching TiVo'd sports -- asked, "Is this happening right now?!" We got a few more channels than the neighbors because Dad sprang for a gigantic antenna on the roof. There was a gadget sitting on top of the tv -- a big dial that you turned when you changed channels, to get the antenna pointing the right way. I still remember the grinding sound . . . . 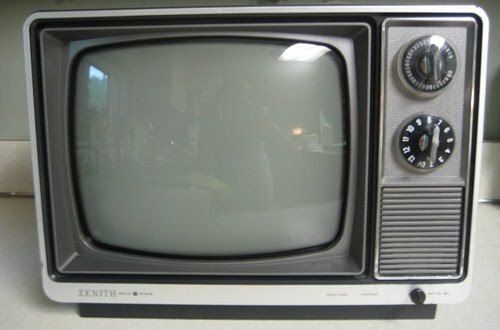 In the early '70s, we had a Zenith B&W TV that had tubes in the back. When you turned it on, it needed a couple of minutes to warm up. Most of my friends had color TVs, but the colors were always off; most people looked orange (John Boener would feel right at home! ), and the pictures were always fuzzy. None of my friends had cable except for one. His family had HBO when it was brand new; they broadcast 2-3 movies a day, and the rest of the time was dead air (except for a countdown to the next movie). I had another friend who had cable around the time MTV launched, so we'd all go to his house and watch videos (a BIG deal in the early '80s).